Mitsuyoshi Toge, born in Hiroshima in 1917, was a Catholic and a poet. He was in Hiroshima when the atomic bomb was dropped on the city on August 6, 1945, when he was 28 years old. After the war, Toge became a leader in the peace movement. He published a number of books opposing the atomic bombing and advocating peace. While hospitalized with tuberculosis at the National Hiroshima Sanatorium, he published the book A-bomb Poetry. When it was sent to the 1951 World Youth Peace Festival in Berlin as one of Japan’s representative works, A-bomb Poetry gained international acclaim. On March 10, 1953, Toge died at the National Hiroshima Sanatorium. He was 36 years old. 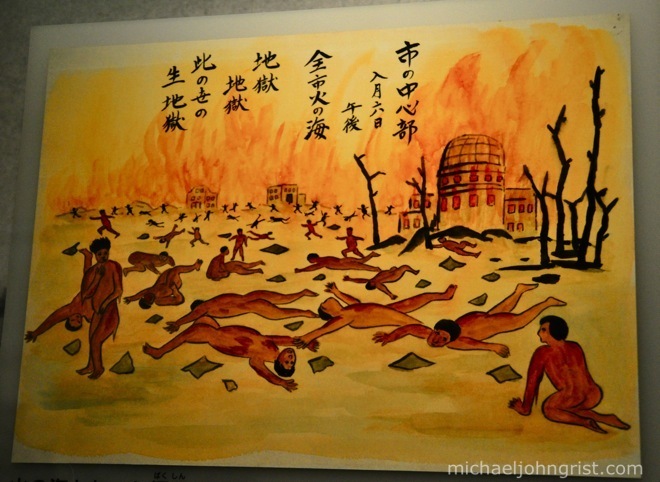 This poem is from Hiroshima-Nagasaki: A Pictorial Record of the Atomic Destruction (1978). Hiroshima, all full of boundless heaps of embers. Heaps, and God knew who they were? Prevailing over the city of three hundred thousands? or we will become Shadows 0n the rock.